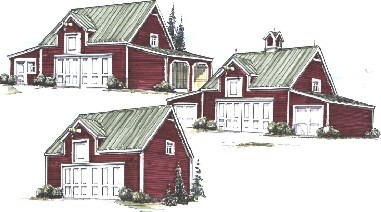 All of the designs in the Elm series of barns, garages, coach houses and workshops can be built from the same set of plans. You'll receive detailed construction drawings for a 24'x24' Main Garage/Barn with stairs to a 24'x24' Loft. You'll also receive plans for a variety of optional sheds that can extend the Main building on either side and across the back. Build a 24'x24' two-bay garage, barn or workshop now. Then add extra parking bays on the sides or across the back. Or, add an easy-to-build storage space, studio, tractor shelter or woodshed. Or, add a shed across the back to extend your garage for big vehicles, boats or trailers. Build small now and then expand your building as your needs grow. Or, build exactly the layout you need right away. You can customize your building with your choice of layouts and your selection of exterior materials. Blueprints, by architect Don Berg, include all the drawings you'll need to build any of seven sample designs that are shown on those plans, or you can create your own custom building layout. Areas: Floor Area of Main Garage/Barn - 576 Sq. Ft., Floor Area of Storage Loft - 576 Sq.Ft. Add-On Sheds: Sheds are 12'x12' (144 Sq.Ft. ), 12'x18' (216 Sq.Ft. ), 12'x24' (288 Sq. Ft), 10'x18' (180 Sq.Ft. )and 10'x24' (240 Sq.Ft). They are designed for use as additional storage space, open shelters, carports, garages, tractor shelters, workshops, garden sheds, open equipment shelters and woodsheds, and are planned to be easy-to-build on either side of the Main Garage/Barn, or across the back. They may be built at the same time as the main barn, as shown in the various sample designs, or added later as your needs grow.